Coventry Log Homes, Inc. is not the rental company and is not responsible for scheduling or answering rental questions. Looking for the perfect getaway this holiday season. Come stay in our brand new log cabin set on an acre of land with beautiful mountain views. The main level has a comfortable living area with a 43" SmartTV, Directv, WiFi, and a heat and glo propane stone fireplace for those nights when you want to curl up with a relaxing glass of wine or a good book. The kitchen is fully equipped with new appliances and seating for 6-8. All three bedrooms have queen sleep number beds. There is a full size bathroom on the main and a 3/4 (60" shower) in the lower level. For the summertime rentals we also have central air conditioning. The Lazy H Campground is a private campground where fun and family are a way of life. This new campground is nestled between the Big Sioux River and the northern entrance of the scenic Loess Hills Byway in far northwest Iowa. This picturesque campground features private cabins on Little Pearle Lake, a 50-acre fisherman's haven stocked with freshwater fish, miles of hiking/biking trails, water activities and more. Vacation rental cabin. 2 Bedrooms, Sleeps 5, 1 Bathroom. 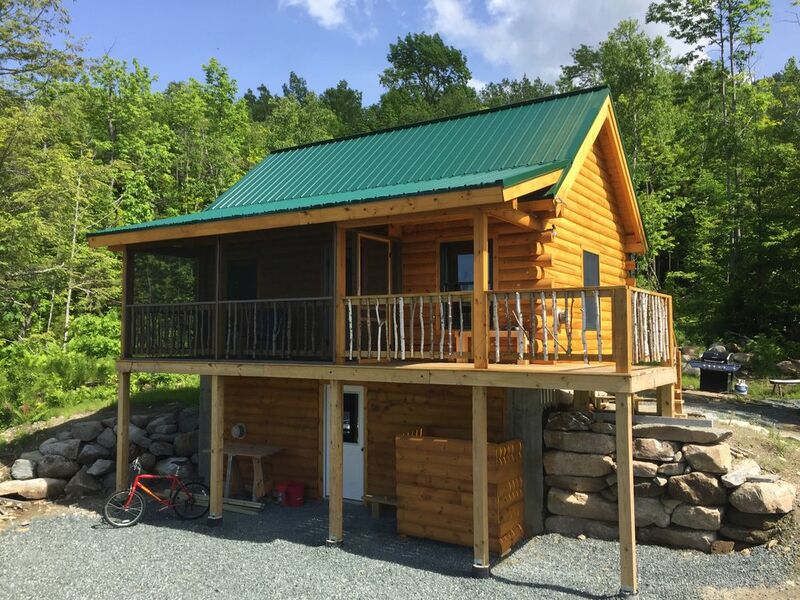 Newly Constructed Log Cabin, just finished in 2017 on 17 acres with 1200 ft driveway provides privacy and fantastic views of Cherry Pond and from Mt Waumbek to Vermont. The Property abuts the White Mountain National Forest and you can hike out the top of the property to Owls Head and Mt Martha which is about 3.5 miles one way and 1600 ft of elevation change. Owls Head offer fantastic views of the entire presidential range. The 1st floor bedroom has a queen bed, sleeping loft has a queen bed and twin bed. All mattresses are new memory foam mattresses. The sleeping loft is accessed by a ladder, not stairs, so it is not appropriate for children under 5 or people unable to climb a ladder. The Cabin is off the electric grid with solar panels and batteries. One full bathroom with shower and an outdoor shower. Fantastic covered screened in porch to enjoy the views and there is a fire pit area with picnic table that also has fantastic views. Vacation rental cabin. 3 Bedrooms, Sleeps 7, Beds for 7, 2 bathrooms. 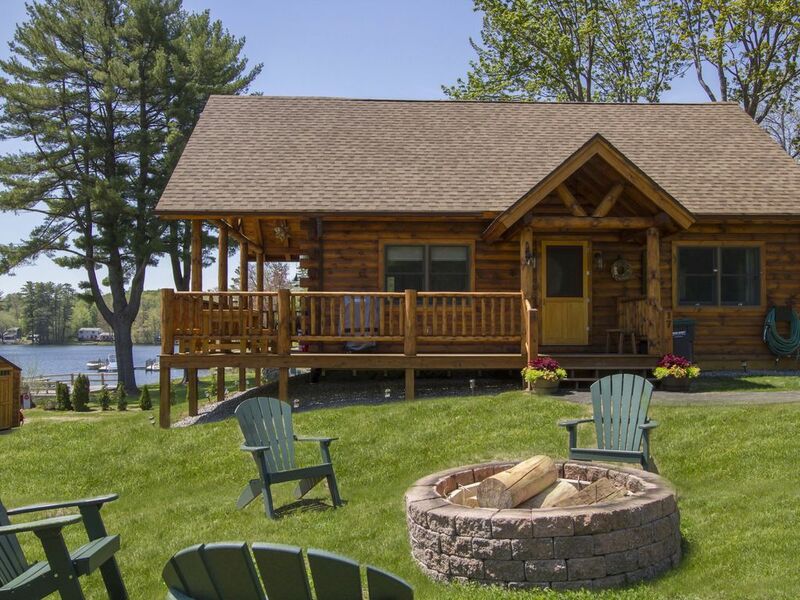 Beautiful 3 bedroom 2 bath luxury log cabin on Lake Winnisquam. Sit on the covered farmers porch and watch the gorgeous lake right from your seat. Wrap around porch with plenty of furniture for the whole family to enjoy the view. Custom farm table and gas grill on the deck to have all your family meals. Open concept floor plan includes; state of the art appliances, custom kitchen with antique island. Gorgeous leather furniture in the living room with lake view and custom gas stone fireplace and large TV. Laundry room, Master suite downstairs has custom glass shower with large walk-in closet, queen size bed and smart TV. Upstairs you will find a quaint loft with beautiful lake views TV and leather sleep sofa with temperdic single mattress which is perfect for one. Large full bathroom with double sink and bathtub. Very large master suite with queen bed and smart TV. Then...... this rooms has beautiful custom sliding barn doors that can be closed off for privacy and the third bedroom is on the other side of these doors. This room has custom built-in bunk beds made from old antique barn beams and smart TV. These two rooms are perfect for all the kids or the parents at one end and small children at the other end. Vacation rental cabin. 3 Bedrooms, Sleeps 8, Beds for 8, 2.5 bathrooms. Beautiful cozy with rustic design throughout the entire cabin. Designer decorated 3 bedroom and 2.5 bath brand new home. This is the perfect getaway for your family. Gorgeous farmers porch to watch the beautiful sunset or sunrise. Wireless internet throughout the entire house. Surround sound, Open concept with cable TV's (all smart TV's) in all bedrooms, living room and Loft. Brand new furnishings throughout to make your stay even more enjoyable. Beautiful lake views from many rooms. Private beach with boat launch and boat slip. Outdoor bathhouse with outdoor shower so the kids don't bring the sand inside! Huge sundeck with grill and picnic tables. 250' of private sandy beach just steps from your porch. Private beach is shared by our two vacation home rentals. Free canoes and row boats and we include life jackets, oars and paddles. Custom fire pit for those moonlit evenings of s'mores! This log cabin is literally ON THE BEACH! Sit in the master bedroom having your morning coffee and gaze right outside to the beautiful lake. Located atop the sought after location of Wallace Hill in Franconia, NH and just minutes from Cannon Mountain Ski Area, this purpose built vacation property was designed for PURE mountain country enjoyment with all but 180 degree vistas of the Easton Valley and all of Franconia Notch's major peaks, with views of the ski area included. Offering three plushly furnished bedrooms, plus a loft serviced by 2 full & one 1/2 baths, and living spaces that glow with log home artisan details, your family or group of 6-8 will be basking in one of Franconia's finest vacation homes at the Sleepy Bear Lodge. Outstanding comfort from design to furnishings, this Grand Class Log Home is for those looking for the near ultimate and dream home experience. Look no further.... Call 800.247.5536 to have all your questions answered and book your stay today! The perfect getaway!! Come stay in our brand new log cabin set on 3.5 acres of land with outstanding mountain views. The main level of the cabin has a comfortable living area with a 40 in flat screen TV, Dish Network, and Vermont Castings Propane Stove to keep you warm and cozy. The kitchen is fully equipped with new appliances and seating for 8. The master bedroom has a queen size bed, large closet and TV. There is a full bath on the main level. The second bedroom has a full size bed and large closet. The loft area is the perfect set up for the kids. There are four bunk beds and a queen size futon that can be used for sleeping. A 32in flat screen TV, Dish Network, is located in the loft with a Wii and many DVDs for the kids to enjoy. The loft also has a full bathroom and a separate loft area that can be used for relaxing or reading a book. The basement is a full walkout with french doors and is heated. The basement area is set up with benches and coat hooks which makes for a convenient area to store your outdoor coats, boots and equipment. No detail has been left out! Come vacation in luxury! 3 bedroom, 2 bath log home with gorgeous rustic hardwood floors, custom stone fireplace, leather sectional couch and flatscreen TV are on the first floor with huge dining room table and granite kitchen complete with high end appliances. Master bedroom with a pillow top queen mattress is also on the first floor with a flat screen TV and a full bath with beautiful glass tile in the shower and granite vanity. Also in full bath is a washer and dryer for your use. Second floor has a bedroom with a pillow top full mattress and a bedroom with twin bunks. Another full bath is located on the second floor as well. Cozy loft area overlooking main floor. Home has central air and heat to keep you comfy all year long. It also has cable TV and wifi. Extra long covered farmers porch with plenty of adirondack chairs to relax on wait for you! Enjoy the splendor of a New Hampshire vacation in our cozy and beautiful log cabin home: Hilltop View Lodge!